In today's Windsor Star, it was reported that Windsor was near the bottom in liveability rankings according to the Pembina Institute. Now, this isn't the first time we've been rated fairly low as a city, but there was that one time when the Mayor bought a lot of advertising in that one magazine and then received glowing...oh, never mind. This time though, the think-tank that did the ratings doesn't sell advertising, so Windsor was about to be judged on it's own merits. It did pretty bad - I needn't tell you. Over the past few years, the Pembina Institute (whose mission is to advance sustainable energy solutions through innovative research, education, consulting and advocacy) has taken a strong interest in issues related to the environmental, economic and social sustainability of urban communities in Ontario. 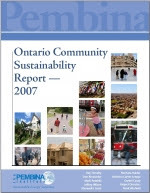 Their most recent report - the Ontario Community Sustainability Report - 2007, was just released in July of this year. This study employed 33 indicators in three broad categories (smart growth, livability and economic vitality) seeking to inform the debate on community sustainability and smart growth in Ontario as the provincial government continues its major reform of the planning system with ambitious goals to stem sprawl and promote community sustainability throughout the province. In a nutshell, our continent has adopted a method of building its urban landscapes that encourage sprawling uses of land (whether industrial, residential or retail) which is very difficult to service through public transit, let alone more sustainable methods of mobility such as walking or cycling, because of the shear distances involved. Thus, people living in these communities have to rely on their cars, and governments have to provide a vast network of roads, bridges, overpasses and expressways to make it all work. Paying for this automobile network uses up a large portion of the public money available for investment in the transportation system, further undermining the possibility of an efficient and reliable transportation system. Congestion also undermines the economic health of the city as commuters and cargo spend time in traffic jams and business investors begin to look elsewhere. Declining tax revenues further undermine investment in transit development and social services in the city, and drive more people to the car-dependant suburbs or outlying bedroom communities. These dynamics make urban sprawl a self-reinforcing, vicious circle. A sustainable urban design makes for a self-reinforcing, more virtuous circle: compact urban form with a fine grain mix of land uses makes for a more efficient and economical transit system. Good transit services encourage people to live near or establish work places on transit routes, which intensify into higher density corridors and urban nodes. Higher density development provides a range of housing opportunities that can, in turn, attract a wide range of employers and employees. Employment opportunities, less traffic congestion, more space dedicated to ecological and recreational uses, good transit and affordable housing are all factors that improve quality of life and attract new residents that - if properly settled - contribute to a healthier economy. This is what Pembina's report - and common sense - is hoping we understand. Tomorrow, let's take a closer look at Pembina's report to find out just how Windsor competes in the global competition of quality-of-life and liveability. Most of the factors which will translate into our economic survival. Posted by Chris Holt at 9:50 p.m.